When my husband was offered a short-term work project in Las Vegas, I admit I wasn’t thrilled. However, I was invited to visit on weekends so we decided to make the most of the opportunity. I recently left the cold and snow behind for the city that never sleeps. We decided to rent a car on Saturday to drive approximately 20 miles to Red Rock Canyon National Conservation Area in the southern Mojave Desert. After picking the car up at the Avis office in the Bellagio, it was easy access to the expressway. It’s beautiful as you drive closer to Red Rock Canyon – colorful mountains soaring high into the sky. The conservation area covers more than 195,000 acres and welcomes more than one million visitors each year. It was awesome to leave the noise and chaos that fills the Las Vegas Strip to enter a quiet nature area. Red Rock Canyon has something for everyone – a 13-mile scenic drive (that also is great for biking), more than 30 miles of hiking trails, rock climbing, picnic areas, nature watching, a bookstore and visitor center. After entering the conservation area, we stopped at the visitor center to pick up a map and received some general trail information from the friendly staff. There are many trails to choose from, ranging in ability from easy to moderate to strenuous. Keep in mind these trails aren’t like many of the well-groomed trails in local parks. Almost every trail has loose rocks and even small to large rocks to climb up and over. I found myself needing to really pay attention to the trail footing – the loose rocks could easily trip or twist an ankle (or my titanium rod!) – so stopped often to look up and enjoy the scenery. While there were plenty of cars on the scenic drive and at the various marked stops along the way, the trails were surprisingly sparse of people. Look out for the cactus! It was in the mid-50s and sunny throughout the day, making for comfortable hiking conditions. Red Rock Canyon has varying types of rock throughout the area, highlighted during the scenic drive where you see sandstone and limestone. On various trails you can see signs of rock art, or petroglyphs, and agave roasting pits. 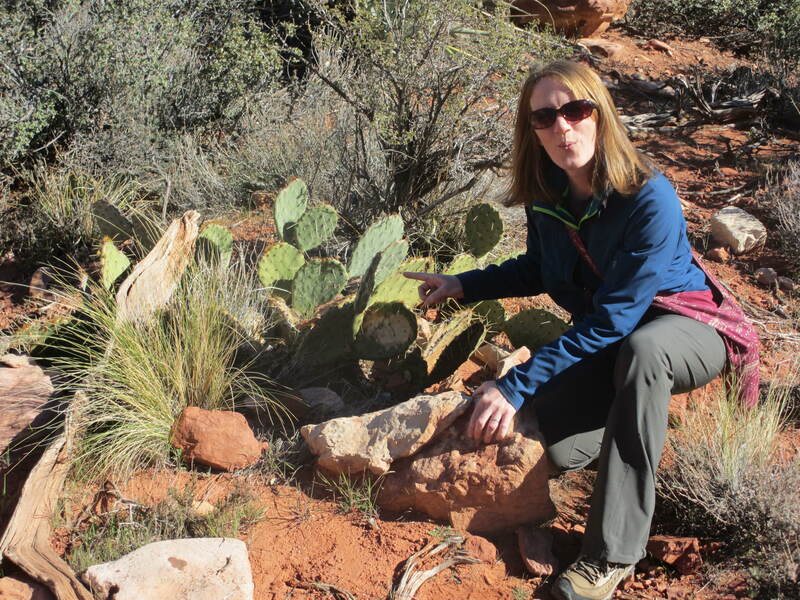 We came across different vegetation, including cactus, yucca, creosote bush and Joshua tree. We didn’t see much wildlife but it is still considered winter (the lack of snow and warmer temps made it feel like spring in Michigan!). At the visitor center, an exhibit highlighted recent graffiti problems and the irreparable damage these obnoxious, thoughtless people do to these historic locations. Sadly we spotted some of the identified graffiti locations on one of our hikes to a waterfall. It hurt my heart to see the damage. We really enjoyed our day at Red Rock Canyon and would certainly go back in the future. If you go, don’t forget water, sunscreen, few snacks, camera, and perhaps layer your clothing to adjust to temps. There is little to no cell phone reception. Daily entry fee is $7; annual pass is $30; American the Beautiful annual pass is $80 (this is honored by the U.S. National Park Service, U.S. Forest Service and several other government agencies). I love Red Rocks. In the 90s I used to go rock climbing there Phenomenal beauty. We saw quite a few rock climbers during our visit. Fun to watch them. Beautiful place.